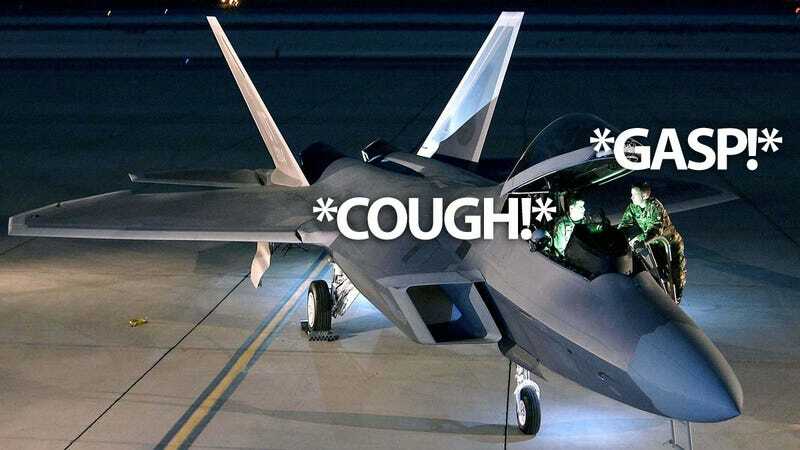 There is still no official explanation for the ongoing hypoxia-like symptoms experienced by F-22 Raptor pilots. The USAF investigation concluded that they have no clue. Now, someone else claims to know the source of the problem, which has grounded the fleet repeatedly. Pierre Sprey—father of the A-10 Warthog and mother of the F-16 Viper—says that the problem is the glues used to keep the fighter's stealth coating in place. Sprey says that the heat caused by the air friction at high speed—above Mach 1.6—may be causing the glues to emit toxic gases that affect the pilots. If true, this also explains why ground crews are having similar problems. They would be exposed to some of those toxic gasses after landing. The aircraft's high speed and maneuverability also causes continuous repairs on the F-22 stealth coating, which requires more glue applied through the airplane. It's a vicious circle, he says, which "increases the risk to the pilots." The US Air Force claims that this is not true and no toxins have been found on the pilots' blood, life-support system or cockpit air samples. Sprey said that the military haven't really look into the glue problem because the USAF couldn't find the toxins in the pilots' blood. He also claims that they don't really want to look into this problem because it would cause a huge problem for the Pentagon, requiring "major rebuild of the airplane." This would also affect the F-35 Lightning II, he says: "the F-22 and the F-35 are three-fourths of the Air Force budget, and that is what is at stake."